In Yammer 104 I wrote about how Yammer can be an all-purpose GTD reference filing system, and not just for individuals but for a company. You can write relatively brief posts about a topic, and can include hyperlinks to external Web sites or to intranet pages. But what if the information you want to share is in the form of a document, not a Web site URL? So my team members can just click the link to the attachment and download the PDF I posted. I don’t need to send the PDF as an email attachment, but my team members know the document is there to be reviewed if they want to download it. This is a really well-done feature, with an interface that matches the conventions we’ve come to expect for uploading files. And it makes a significant step toward making Yammer the all-purpose knowledge-sharing service for the enterprise. The updated version of Yammer’s iPhone application supports viewing the attachments that are included in Yammer posts. That’s well integrated, too, although I couldn’t view Word documents as I can within the iPhone Mail application. But for viewing PDFs it was fine. I uploaded a few different file types as a test: PDF, Word (.doc) and even a couple of mp3 files. The largest file I tried was 18 MB, and it worked flawlessly. Maybe the Yammer team can fill us in on the file types that are supported, and any size limitations. But meanwhile, if you haven’t yet tried Yammer, I’d encourage you to explore it, and the SMUG Yammer curriculum can be your step-by-step guide. I’m impressed at the way Yammer is continually improving its product and adding important and useful features. In a previous post I wrote about Senduit.com, which has a nice, elegant interface for file sharing that doesn’t require you to sign up for an account. I’ve used it some to send video files and other files that are too large for e-mail attachment. I began looking for alternatives, though, because I have had mixed results with Senduit. Sometimes it requires people downloading files to wait up to 120 seconds for the download to start, and then sometimes Internet Explorer (for those consigned to the Windows world) blocks the download. And I’ve had the uploads time out on several occasions. So I signed up for the Dropbox private beta, because it looked like it had a nice interface. And for synching across multiple machines, it seemed really slick. I just got into the private beta last week. The thing I really like is that each file you upload has a URL, so you can link to a video file on Dropbox from your blog. It’s like an FTP server without the complications. So here’s an example of a video I shot of my daughter Rebekah taking a volleyball off her head during a recent match. Click here to play or right-click and “Save as Target” to download. The file I put up there was in QuickTime, which some of you Windows users might not have. So here’s another example, of a photo of me with Rebekah, from a year or two ago. Dropbox is now out of private beta and is available to everyone. A 2 GB account is free, and for about $10 a month you can have 50 GB of storage. I will probably do a follow-up post with a screencast demo of how to use this for making larger attachments available in your blog posts, but for now you can click the photo and video links above to see how it works on the blog reader side. My later post will show you how to create those links. In the comments below, please let me know how the download worked for you. Was it relatively quick, or kind of sluggish? Today I ran across a simple, elegant free site that’s a great alternative to a complicated ftp site. 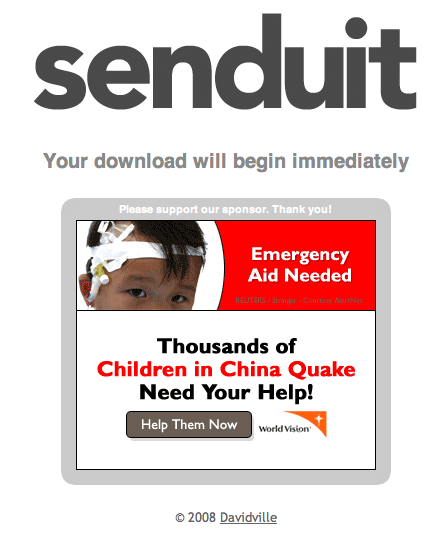 If you need to share files that are too big to e-mail but less than 100 mb, Senduit is an excellent choice. Almost all social software utilities like Facebook and YouTube are free, because as Chris Anderson says, there’s a huge psychological difference between $0.00 and $0.01. The price of admission for these sites is usually creating a username and password. Not a huge barrier, and there are benefits that accompany the accounts, but it still creates some hassle in getting started with a service. They can click the link and the download starts automatically. Note: This link should be working until about June 4, 2008. It’s video I took of some friends and former patients who were back in Rochester to visit last week. You can read their updates here. If you’re reading this post after that date, give Senduit a try with your own file. The name, type, contents, and origin of your file are not saved, reviewed, or analyzed. The only monitoring that takes place are our automated tallies of file uploads and our automated cleaning of expired files. Although we take appropriate measures to ensure the privacy of our user’s data, it’s impossible for us to guarantee 100% security. For this reason, we suggest you do not use our service to share sensitive data. Once a file has been uploaded, it is your responsibility to share your file’s address in a secure manner. 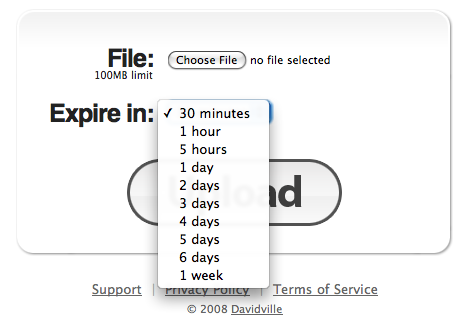 All uploaded files are designated to expire at the point in time selected (anywhere from 30 minutes to 1 week). After a file has expired, it becomes inaccessible to the public and is permanently removed from our systems. Unlike the annoying pop-up ads you see on newspaper web sites, this isn’t one you’d click to skip. And when you click the ad it opens in a new window, leaving your download happening in the background. This seems like a great, user-friendly service, and the only real costs should be bandwidth. Files never stay on their servers for more than a week, so storage costs should be negligible. Like they say, you wouldn’t want to place highly sensitive files on their servers, but it appears that the odds of someone randomly finding your URL are something like 1 in 2,176,782,336. Give Senduit a try and let me know what you think about it.